Redding 10x is designed for pistol-sized powder charges. 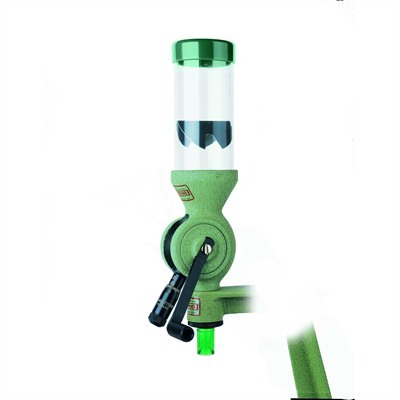 At $180 street price at the time of the writing (November 2013), it is, as far as I know, the most expensive powder measure designed for pistol. 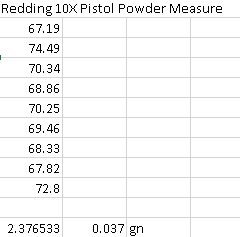 While running a completely unrelated experiment testing powder scales, I happened to accumulate statistics for its accuracy dropping Titegroup powder. Titegroup has the same composition as most pistol powders - tiny flakes - and measures really well. So the estimate of the standard deviation of the population is 2.4mg, or 0.037gn. Interestingly, it is a bit worse than that of Dillon XL650 powder system, which measures at 0.028gn. So on one hand, it is definitely "good enough" for competition loading, and on the other hand it offers absolutely no advantage over the progressive press - and costs almost twice as much as Dillon's quick-change system (which includes their powder measure, the toolhead, and the toolhead stand). I guess - save your money for use elsewhere!